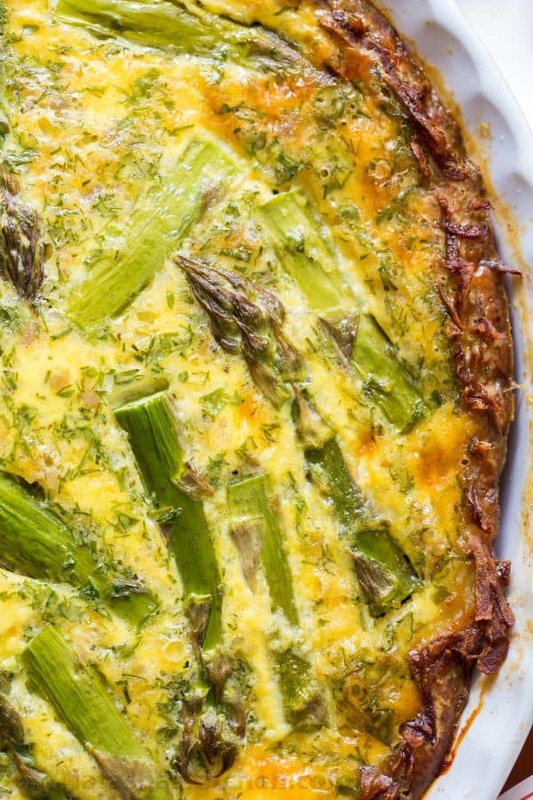 Every bite of this Sausage Asparagus Quiche is pure comfort. 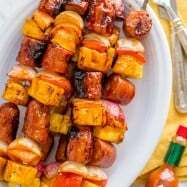 It is loaded with juicy sausage, eggs and wholesome feel-good ingredients. The asparagus and herbs balance the whole dish making it fresh and bright. 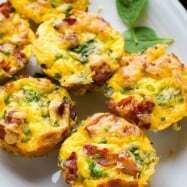 TABASCO® Sauce enlivens the flavors of this classic brunch recipe and Smithfield Fresh Breakfast Sausage makes this quiche next-level delicious. Thank you to our friends at TABASCO® Brand for sponsoring this simple and flavorful quiche recipe. 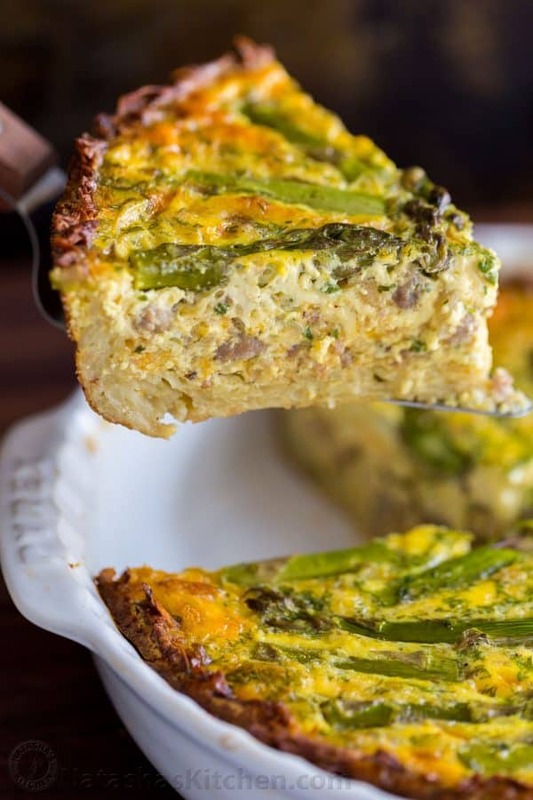 This Sausage Asparagus Quiche is so satisfying and perfect for brunch! Think: Mother’s Day, or Sunday Funday! This is so much better than going out. The flourless potato crust is naturally gluten free and if you’re lucky enough to have leftovers, quiche reheats really well! 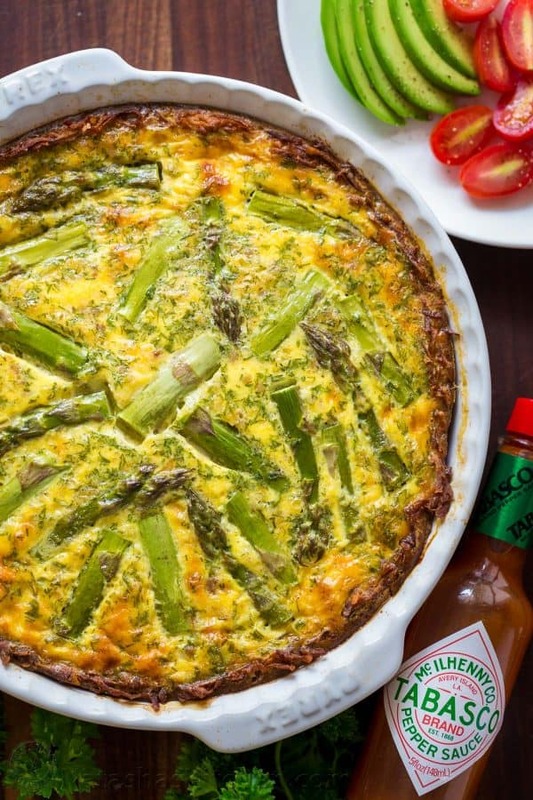 The addition of TABASCO® Sauce gives the quiche just the right amount of mild heat and wonderful peppery flavor. Serve with more TABASCO® Sauce of course. Is there anything TABASCO® Brand doesn’t improve? In my ridiculous obsession with that tempting little bottle of hotness, we actually have a TABASCO® Sauce category on our site (don’t laugh). 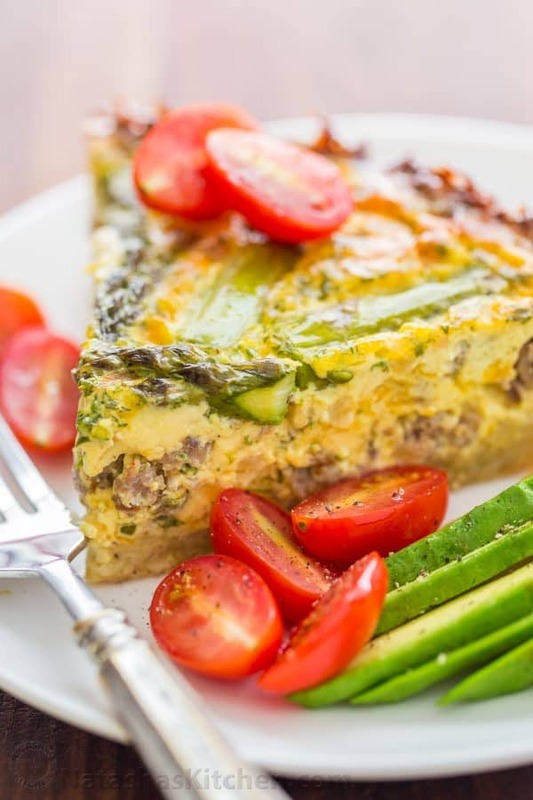 Every bite of this Spicy Sausage Asparagus Quiche is pure comfort. The asparagus and herbs balance the dish making it fresh and bright. 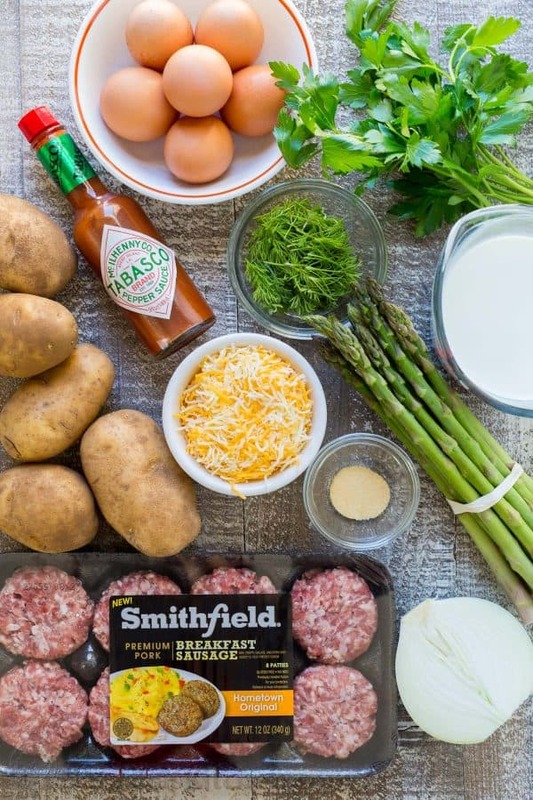 TABASCO® Sauce enlivens the flavors of this classic brunch recipe and Smithfield Fresh Breakfast Sausage makes this quiche next-level delicious. Preheat oven to 425˚F. Generously butter a 9" pie dish. Peel and grate potatoes and squeeze out excess moisture with your hands then squeeze dry with 2 paper towels. Transfer dried potatoes to mixing bowl and add 1 egg, 1 tsp salt and 1/4 tsp black pepper. Quickly stir together until well combined then press into the buttered pie dish, molding the potatoes evenly over the bottom and all the way up the sides of the dish. Bake right away uncovered at 425˚F for 30 min. Remove from oven and decrease temperature to 350˚F. Meanwhile in a large skillet over medium/high heat, add Smithfield Fresh Breakfast Sausage and sauté just until cooked through (5 mins). Add diced onion and sauté 5 min or until golden and sausage is starting to brown. Remove from heat and let cool while making egg mixture. 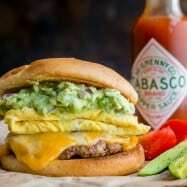 In a large mixing bowl, combine 5 eggs, 1 1/2 cups half and half, 1/2 tsp salt, 1/4 tsp black pepper, 1/4 tsp garlic powder, and 2 tsp TABASCO® Sauce** then whisk together until combined. Stir in 1 cup cheese, 2 Tbsp parsley, 1 Tbsp dill and the cooked sausage mixture. Pour mixture over prepared potato crust. 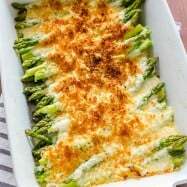 Arrange sliced asparagus pieces over the top and bake uncovered at 350˚F for 55 to 60 minutes or until the center is set and no longer wobbles when you give the pan a jolt. P.S. Do you share my obsession with hotness? Let me know your favorite way to enjoy TABASCO® Sauce in a comment below! My quiche came out tasting a little fishy. I added dill weed since that is what i had in my pantry. Is dill weed the same ingredient you are calling for in this recipe? Did you end up making this dish with frozen hashbrowns? I wonder whether you made any changes. Also, would you care to comment on how it turned out? Natasha, I am using an HP desktop, HP Envy printer with Microsoft Edge browser. Yes, I see the link after I click the print button on the first page, then when I click print on my printer page it will start to print but will automatically stop printing and release a blank page from the printer. And this only happens on your page. 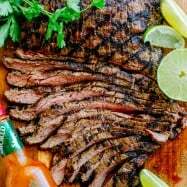 I have printed tons of recipes form other pages with no problems. I’m confused! Hi Frances, I really have no idea to be honest. Have you tried printing at work or anywhere else to see if it is a printer issue? Also, I would suggest making sure your browser is up to date. I really am not sure why that is happening and I haven’t gotten any other reports so I’m not sure it’s widespread issue. Sorry I can’t be more helpful! Hi, Natasha, love your recipes and especially the videos and pictures! Keep up the good work! Hi, Natasha, I managed to make it in the right dish 🙂 didn’t have asparagus so put some yellow bell pepper. It came out delicious! All the ingredients work out very well together! Thank you for your efforts in making cooking a real pleasure! Natasha , I have been following your recipes for quite a while . I have made pretty many dishes from your blog . I had left some comments before always positive;) . You are into something (ONE OF THE BEST BLOGS). Congrats !!!!! I have a very picky hubby and of course the crowd who comes to hang out with us! So far none of your recipies let me down . Superb job!!!! Looks amazing! 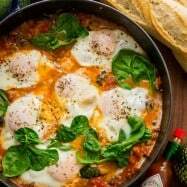 I usually do “fancy” breakfast on Saturday and Sunday for the family and I can’t wait to make it this weekend!! Could I take a short cut and buy the shredded hash browns in a bag?